Despite those accolades listed above, Cliff Hagan is likely best remembered as the final piece finagled by St. Louis Hawks owner Ben Kerner from the Boston Celtics in exchange for Bill Russell’s draft rights. The Hawks already had pried Hall of Famer Ed Macauley from Boston and now this Kentucky standout would be coming to Missouri. As it turned out, Macauley’s days were coming to end while Hagan emerged not only as a powerful force for the Hawks, he’d turn out to be a Hall of Famer in his own right. That textbook hook shot of Hagan’s was his most devastating weapon, despite being a 6’4″ forward. He could release it with a staggering rapidity and was also a terror on the offensive boards. Along with Frank Ramsey, Hagan led the Kentucky Wildcats to incredible success capturing the 1951 NCAA title as a sophomore. Although graduating in 1953 and being drafted by the Celtics, Hagan actually decided to play one more year at Kentucky as a graduate student. He led the team to a 25-0 record. Finally leaving the confines of the Bluegrass State, Hagan didn’t immediately join the NBA. Instead he did two years of military service and upon completion of his duties with Uncle Sam, Hagan was then involved with that fateful Russell trade in the summer of 1956. At the age of 24 in the fall of 1956, Hagan was at last beginning his NBA career. Initially, it appeared Hagan wasn’t worth the wait. His rookie season was largely unimpressive. Given his 6’4″ height, Hawks coach Red Holzman mistakenly tried to utilize the burly but quick Hagan as a shooting guard. He may have been small but his style and skills demanded that he play forward. Thus for nearly half the season this charade went on until finally Holzman was axed as the stumbling Hawks boasted a 14-19 record. After a brief experiment with point guard Slater Martin as player-coach, forward Alex Hannum took over as player-coach and he put an end to the Hagan at guard experiment. He moved Cliff to his natural forward spot. Although the Hawks ended up finishing the season 33-39, they were gathering steam as a powerful postseason force. Hagan finished with a scant 5.5 ppg and 3.7 rpg in only 14 minutes of action. In the playoffs, though, the super rookie exploded. In a tiebreaker match to decide homecourt in the playoffs with the Minneapolis Lakers, Hagan ignited for 28 points and 15 rebounds while Bob Pettit sealed the deal with 10 overtime points as the Hawks finished off the Lakers 114-111. In the actual series that commenced, Hagan and the Hawks swept the Lakers 3-0. The final game was a barnburning 2-OT affair that ended 143-135. Awaiting the Hawks in the NBA Finals were the Boston Celtics. Opposing Hagan was his old Kentucky teammate Frank Ramsey who was now the 6th Man for Boston. Initially Hagan played rather ho-hum this series, but he began to warm up in Game 3. With just under four minutes left, Hagan made a steal and went coast to coast for a dunk to tie the game at 91. Seconds later he again stole the ball and this time fed Med Park for a layup putting St. Louis up 2 points. The Hawks won the game on a go-ahead Bob Pettit jumper with 40 seconds remaining. The Celtics took Game 4 123-118, but Hagan enjoyed his best game yet in the series with 25 points and 9 rebounds. His finest moment came, however, in Game 6. St. Louis was down 3-2 in the series and the score was tied at 94 with time for one more shot in regulation for the Hawks. Bob Pettit took the jumper but missed. The lithe Hagan still managed to slip in and tip home the miss as time expired. It was the final two of his 16 points that game to go along with 20 rebounds. In the decisive Game 7, which went to double overtime, Hagan scored 24 points but Boston finally vanquished the Hawks 125-123 to win the title. 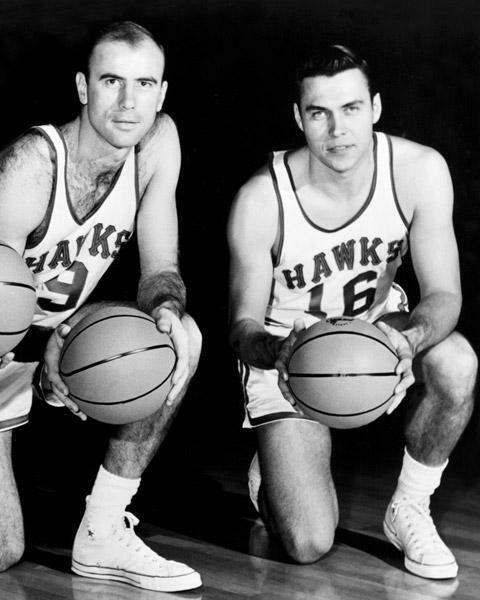 Bob Pettit and Cliff Hagan of the St. Louis Hawks are forming a one-two punch unmatched in the history of the [NBA]. Through games of Sunday, Feb. 8, , Pettit had scored 1,559 points and Hagan 1,277 for a total of 2,836. Between them, they accounted for an average of 52.5 point s per game and they need only a combined average of 30.9 the rest of the way to top the all-time combo mark of 3,392 set by Paul Arizin and Neil Johnston of the Philadelphia Warriors in 1957. The Hawks again appeared in the Finals in 1958. Bob Pettit sealed the series with his spectacular Game 6 effort of 50 points, but Hagan was in lockstep with Pettit in helping St. Louis win the series including huge efforts of 33 points in Game 1 and 37 points in Game 2. Hagan led all scorers that postseason with an average of 27.7 points. He would repeat that scoring prowess in the 1959 postseason with an average of 28.5 points. But the Hawks failed to repeat as champs losing to the Lakers in the Western Division Finals. The Hawks mounted their final serious challenge for the NBA title in 1960. Again Hagan and Pettit, now with Hall of Fame center Clyde Lovellette on board to form the an absolutely punishing frontline, pushed the Celtics to a 7-game classic series. After having been blown out in Boston in Game 5, the Hawks were down 3-2 and facing elimination. Hagan responded with another big game performance: 36 points and 13 rebounds, but also injured his leg in the final minute. Back in Boston for Game 7, the sore Hagan still managed 19 points but only 5 rebounds as the Hawks fell 122-103. Although they made the finals the following season in 1961 (losing in 5 games) and would prove a tough out every year thereafter for their Western Division rivals, the Hawks days as contenders had finally passed. So too did Hagan’s days as a starter. Beginning in 1963, Hagan was moved to a 6th Man role with the arrival of rookie Zelmo Beaty. Not that Hagan could complain much, he still got to run and gun coming off the bench. In his final four St. Louis years, his rebounding collapsed to 4 a game, but his scoring punch remained potent with 15 points a game in just 25 minutes. Finally, Hagan retired from the NBA in 1966, but his time away from basketball didn’t last too long. The colorful American Basketball Association began operation in 1967 and Hagan was lured back into pro ball as the player-coach of the Dallas Chaparrals. Now, what’s been neglected to this point is Hagan’s legendary on-court temper, which he downplays as mere adrenaline rushes. Off the court, he was courteous and soft-spoken, but on the court he was a demon. And thanks to Terry Pluto’s Loose Balls we have the stories to back it up. After several altercations, Dallas management told Hagan if he were tossed again for fighting he’d be fined $2500. Knowing he couldn’t play without getting into fisticuffs, Hagan stayed on the sideline for the most part after this warning. One game, however, with 40 seconds left and the score tied, Hagan put himself in the game and, ice cold, caught a pass and hit one of his patented, sweet hook shots to put Dallas ahead. At this point, a player from the Anaheim Amigos got on Hagan’s back, which naturally incensed the firebrand. Hagan cold-cocked the opponent, but to his luck the refs didn’t catch the punch and he wasn’t ejected saving himself $2500. But Hagan wasn’t just knocking folks out in the ABA. For one year, at least, he found the fountain of youth. In the 1967-68 season, Hagan put down 18 points, 6 rebounds and 5 assists a game for the Chaps and was selected to the ABA All-Star Team making him the 1st player to appear in both an NBA and ABA all-star game. Over the next season and a half, Hagan now in his late 30s cut down his own playing time and the Chaps were a success on the court losing in 5 games in the Western Finals to the New Orleans Buccaneers in 1968 and in 7 games to that same team in the 1969 Western Semis. Hagan’s ABA tenure was ended in mid-1970 as he was canned as the coach of Dallas. The Chaps themselves would eventually move on to San Antonio and become the Spurs. The ABA Cliff Hagan was a nice, curious footnote to an already Hall of Fame career. Hagan’s partnership with PF Bob Pettit formed one of the great frontcourt duos in league history as they appeared in 4 NBA Finals and won a title together. During Hagan’s halcyon days (1958 – 1962), only Pettit and Cincinnati’s Jack Twyman scored more points from the forward position. During this same stretch, again, despite being 6’4″, Hagan was also the 5th-leading rebounder among forwards. And his underrated passing skills left him with the most assists among all forwards in this period. As he moved into his 6th Man role during the mid-1960s Hagan again excelled. Between 1963 and 1966, he was second in scoring among all players averaging less than 30 minutes per game with only John Havlicek ahead of him. When it came to assists, Havlicek is again the only bench player to top Hagan’s total in that time frame. And if you needed someone to step up his game during the postseason, Hagan was your man, particularly in 1958 and 1959 as he led all performers in PPG and in PER those postseasons. …I got to training camp and [Hawks Coach Red Holzman] told me that due to the depth in the frontcourt and my size, I was a guard, which I had never played before. I barely played the first half of my rookie year and may have never had a career if there hadn’t been a coaching change. Alex Hannum came in as player-coach, Bob Pettit broke his wrist and I got a chance to play. I had some success and stayed in the lineup when he returned.